Alec Baldwin’s satirical Trump memoir, You Can’t Spell America Without Me, reviewed. Alec Baldwin’s satirical Trump memoir captures what is tiring about his Trump portrayal—and most Trump-related comedy in general. 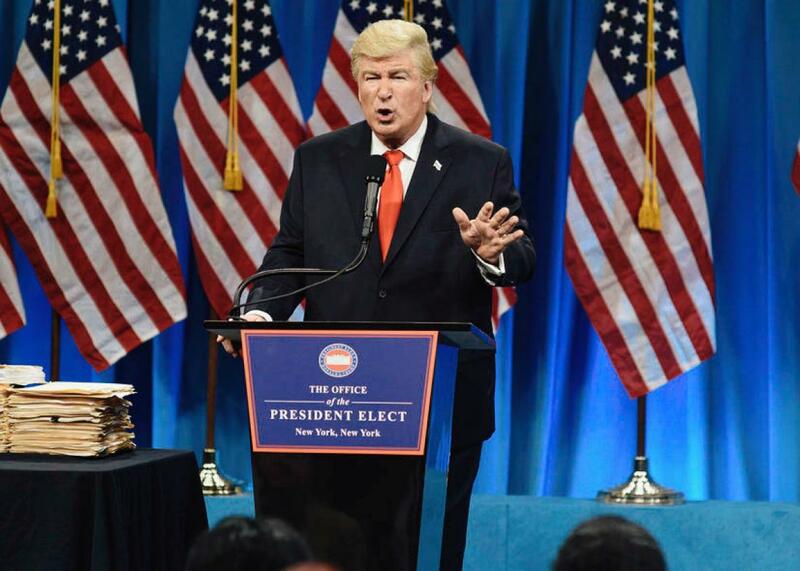 Alec Baldwin as Donald J. Trump during a Saturday Night Live cold open on Jan. 14. How did we let an arrogant, rage-filled, scandal-plagued jerk reach such a position of power, when with every impulsive tweet and blustering interview, he reveals himself to be loudly obnoxious and addicted to attention? I refer, of course, to Alec Baldwin. Not only is Baldwin tasked with the prominent job of regularly pillorying Donald Trump on Saturday Night Live, but now he has, along with Kurt Andersen (whose radio show, Studio 360, is part of the Slate podcast fold), written a book-length parody of the president, You Can’t Spell America Without Me: The Really Tremendous Inside Story of My Fantastic First Year as President Donald J. Trump. It’s a faux memoir where a fictional Donald Trump delivers an account of his first year as commander in chief, with occasional forays into the past—the origin story of his presidential ambitions, for instance, centering on a conversation with Roy Cohn the day the Challenger space shuttle exploded (“so tragic, but I was in a fabulous mood”). On the whole, the book is mostly interested in skewering Trump for egotism, bigotry, and obliviousness. This is far from the first time Alec Baldwin’s brand of machismo has descended into cheap shots or ugly comments. He doesn’t exactly own real estate on the moral high ground. That doesn’t mean Baldwin, who besides acting, has hosted an excellent podcast and less-assured MSNBC talk show, can’t produce excellent comedy. Longtime Saturday Night Live writer Jim Downey once told me he is “the funniest handsome person ever. Or the handsomest funny person.” (Maybe Jon Hamm fans disagree.) But it’s hard to deny that his Trump impersonation has had diminishing returns. It’s been a year since the election, and if no one has made a truly great work of comedy about Donald Trump, it’s not for lack of trying. Late-night hosts have been fixated on the president, and many stand-up comics have incorporated takes on him into their act, but there has yet to be a political special that has been a galvanizing game-changer the way the comedy albums of David Cross were during the last Bush administration in the beginning of the century. Anthony Atamanuik has found some sharp and unexpected lines of attack on Comedy Central in The President Show, portraying the commander in chief as an insecure toddler surrounded by aides nervous about a looming tantrum. In general, though, much Trump comedy feels like it’s serving a therapeutic need more than an artistic one. But at a moment when so much Trump comedy is more sanctimonious than funny, this book feels like more of the same. For those looking for a good, jolly sneer, You Can’t Spell America Without Me will do just fine. It also feels too easy. Imagining Trump as this monstrous other may provide comfort, but his flaws are wired into our culture. A more pointed and probably funnier book might at least nod to the fact that the same New York media and entertainment world that produced Alec Baldwin helped create Donald Trump. Doing that would require a self-awareness and introspection that neither man is famous for. You Can’t Spell America Without Me by Alec Baldwin and Kurt Andersen. Penguin Press.